The early history of Enschede is largely unknown, but a settlement existed around the Old Marketplace in early medieval times. The name of this settlement is mentioned as Anescede or Enscede meaning either "near the border" (with Bentheim) or "near the Es) and sported a church, a marketplace and a fortified aristocratic house. Enschede was granted city rights in 1325 by Jan van Diest, the Bishop of Utrecht and henceforth was allowed to protect itself with a wall. Because a stone wall was too expensive (since stone had to be imported), Enschede had a system of ditches, palisades and hedges instead, which is still reflected in the street-names Noorder-hagen and Zuiderhagen (North Hedge and South Hedge, respectively). The city plan of this era is still recognisable in the street-pattern. Because the medieval city was largely built of wood and stone houses were the exception, fire was a constant risk and a series of fires in 1517, 1750 and again on May 7, 1862 earned the people from Enschede the nickname Brandstichters (arsonists). Most of the city was burned or damaged because of the 1862 fire, only a few buildings were saved. 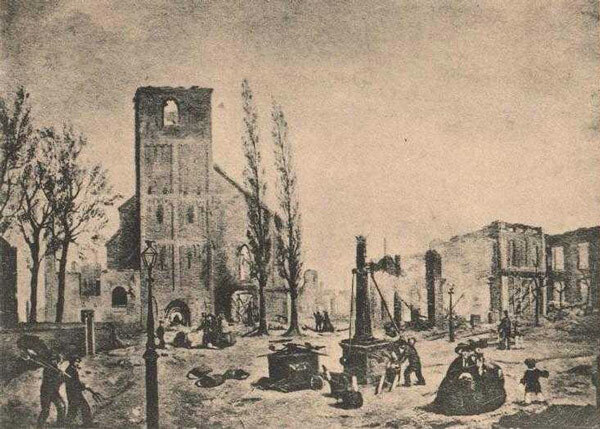 A destroyed town after the 1862 fire. Paiting by L. J. Bruna. The last fire coincided with the start of the growth of the city into a large production center of textiles, originally as a cottage industry, but since the start of the 19th century on an industrial scale, especially the manufacture of bombazijn (a mixture of cotton and linen) proved an export hit. The industrialisation stimulated a large increase in population, which at first was rather chaotic. The names of the slums (like De Krim and Sebastopol) are still notorious, although they have long since been torn down. In 1907 the laissez faire mentality was dropped and Enschede was the first city in the Netherlands to draw up an official expansion-plan, incorporating the (surrounding) municipality of Lonneker. Enschede WWII thumbnail During the Second World War Enschede was one of the first Dutch cities to be captured by the Germans, being the city closest to Germany. Resistance members helped many of the Jews from Enschede to hide on farms in the vicinity. Out of approximately 1300 Jews in Enschede, 500 were saved (38.5%), compared to less than 20% in the rest of the Netherlands. This high survival rate is attributed to three members of the Jewish Council of Enschede, Sig Menco, Gerard Sanders and Isidoor Van Dam who took the initiative, against the advice of the Jewish Council of Amsterdam, of urging their community to go into hiding and not to answer the call-up of the Germans for "labor in the East". They were in a position to support these directions to their flock since they had access to funds, to power in the community and to a well-developed underground movement headed by a prominent Protestant minister, Leendert Overduin (Yad Vashem). Due to carelessness the resistance was betrayed by an infiltrant and all the members were killed by German soldiers while gathered in a basement, the Germans threw in some grenades, a few day before the allied troops liberated the city. Even though "De ondergrondse" (the resistance, litt. the underground) was the main resistance, many citizens risked their life, by for example rescuing allied pilots who where shot down on a bombing mission. 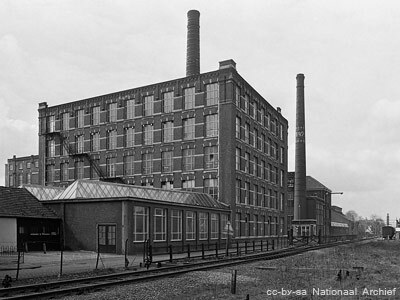 In the 1970 the textile production in Enschede came to a halt and was transferred to the far east. This had a profound effect on the populace and Enschede became one of the poorest municipalities in the Netherlands and (de facto) went bankrupt. Large areas of industrial wasteland now mark the city. Van Heek factory next to the railway to germany at the end of the textile epoch.